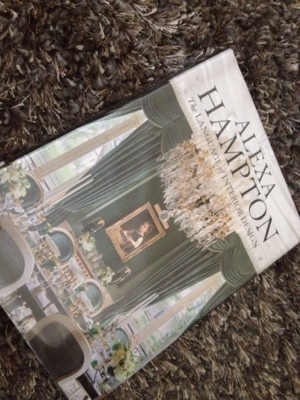 I just “read” The Language of Interior Design, by Alexa Hampton. I say “read” because I technically didn’t read the whole thing, if I’m being honest. I was pretty diligent for about 60% of the book and then I have to admit I just skimmed most of the rest and looked at the beautiful rooms on the remaining pages. First, I should say, that I am unsure if Alexa would approve of the carpet her book is sitting upon, which is a new addition to my living room. I just happened upon this book while browsing the library shelves. It immediately appealed to me. The book is full of great photos and design tips, especially for someone new to the world of design, like me. The one downside I found is that I wasn’t able to relate to many, if any, of the homes or end products. I have come to expect most design books to focus on the perfect end result – that’s just an understandable given. Showing pictures of unfinished bedrooms and half-painted kitchens isn’t exactly good for your brand as a designer, I’d imagine; however, Alexa Hampton’s clients are in a category all their own. I don’t know about you, but I won’t be picking out throw pillows for a literal castle anytime soon. By about halfway through I just became too overcome with the realization that I would never in my life be deciding which drapes I should put in my “garden room” and the fantasy of reading about the pure richness of such things became a bit too much for my tastes. That all being said, I’m sure the intended reader of this book was not, say, moi. Given that I was not the prime audience (did the huge chandelier on the cover not deter me? ), all in all, I found the book pleasurable, if not decadent, and chock full of information and explanation for design choices to help a novice like me. Besides, sometimes it is fun to indulge.